View of the marsh around Calf Creek, and the towering cliffs that surround the hike. 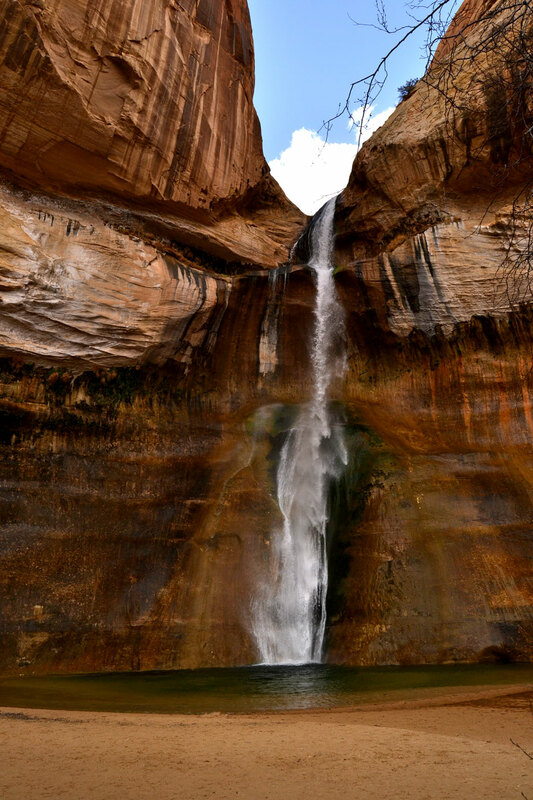 The popular Lower Calf Creek Falls Trail makes a great day-hike, and provides some fantastic views of the canyons of Grand Staircase Escalante National Monument. The hike itself is 3 miles one way to the falls. It starts off as a fairly level, sandy trail following along the red cliffs of the canyon, with some fantastic views of the creek and the marshlands surrounding it, as well as of the rock formations up on the cliffs. Along the hike, you can see some of the features typical of this area; arches, alcoves, and honeycombs stand all over the towering cliffs. There are a few spots where it turns a little bit rocky, but it is still a fairly easy hike with little elevation change. Once you get closer to the falls, the trail winds along right next to the river, through the marshlands. Make sure you grab a trail guide at the trailhead. It has some interesting information about the area. Lower Calf Creek Falls Trailhead. Grab your interpretive trail guide here. 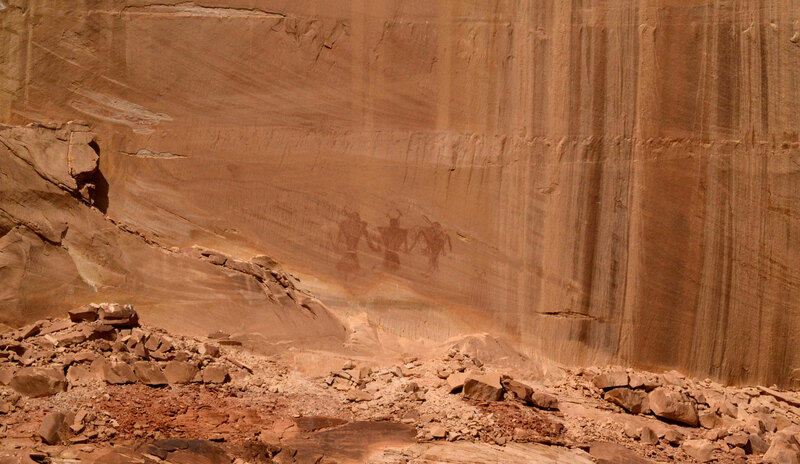 In particular, keep an eye out for the pictographs on the cliffs of three large figures. The pictographs are believed to have been made by the Fremont peoples, a scattered culture of hunters and farmers that inhabited the region until about 1250AD. The figures’ meaning is still a subject of speculation. 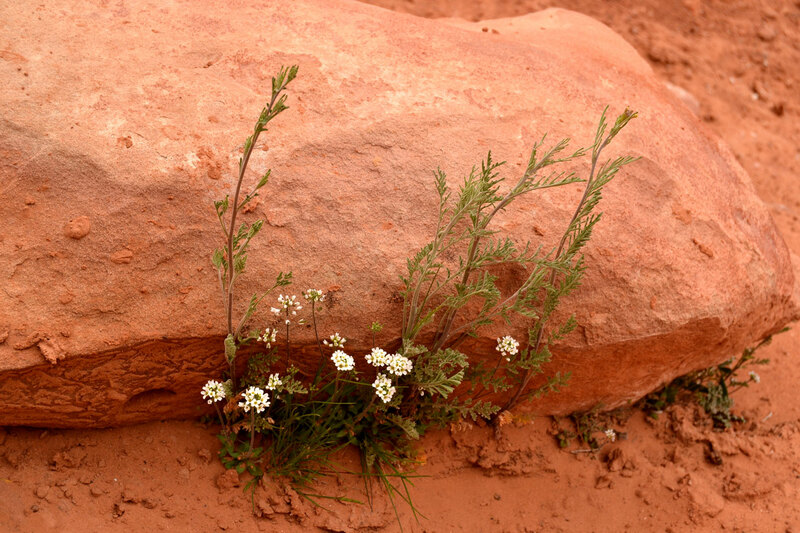 Archaeologists think they may be deities, part of a religious ceremony, or a warning to travelers through the canyon. These Fremont Pictographs may have represented deities, spirits, or they may have been a warning to travelers. Calf Creek Falls is a perennial waterfall. The total height is 214 feet. The lower falls, which can be seen from the trail, is 126ft high. On a hot summer day, the mist from the falls makes a perfect respite from the harsh desert weather! 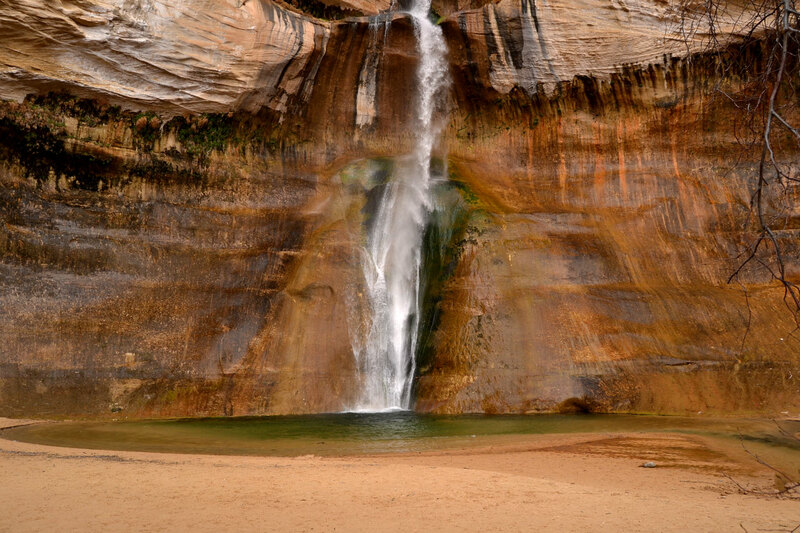 Upper Calf Creek Falls can be reached by a 1 mile scramble, starting at an unmarked trailhead a little farther down Highway 12. The view from Head of the Rocks Overlook, along Highway 12. 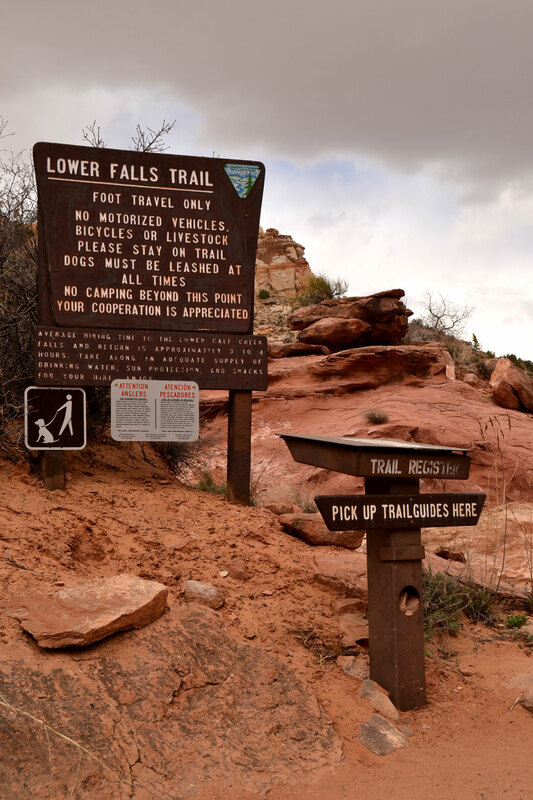 The trailhead is located in the Calf Creek Recreation Area, which is just off of Highway 12 about 15 miles east of Escalante and 13 miles S of Boulder. It’s right at mile marker 75. The signs aren’t particularly obvious on the highway. 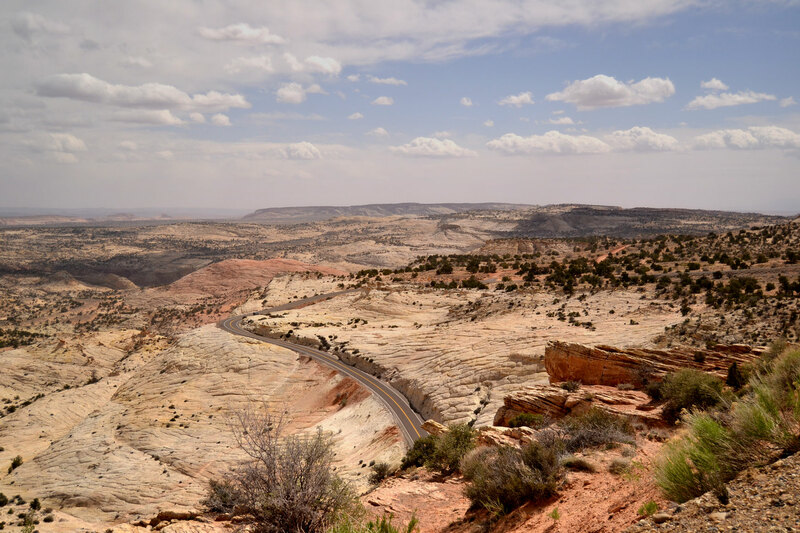 If you’re coming from Escalante, after you cross over Calf Creek, look for camping signs and follow them. The drive will also take you past some stunning scenery and great destinations. Hole in The Rock Road spurs off of highway 12 just west of Escalante. 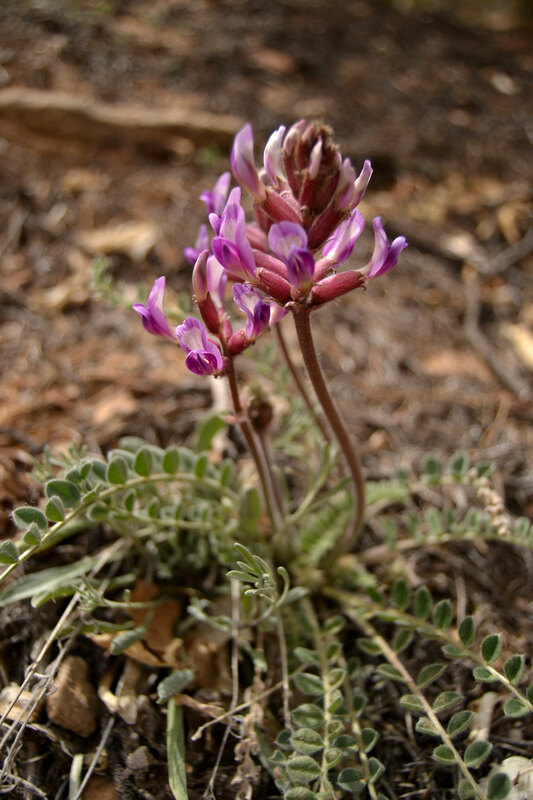 You’ll also pass the Escalante River Trailhead. Keep an eye out for the Kiva Coffeehouse, a popular spot to enjoy a cup of coffee and a fantastic view of the red cliffs. There are only about a dozen campsites, so checking availability is a good idea. There is a primitive bathroom (no running water), and no showers. There’s a two vehicle limit per campsite, but since the sites are so small, you’d have trouble even fitting two vehicles into one of them. As of March 2014, the day use fee is $5 per vehicle. Camping is $15 per night. If you’re a fairly fast hiker, plan on 3 hours minimum for the 6 mile round trip hike. Although the trail is relatively flat, the thick sand can make it slow going. Have water ready when you arrive. When I was there in Spring, the drinking water spickets were shut off, so there was no water source. The bathrooms at the parking lot are closed during the off seasons as well. There is another bathroom on the way to the trailhead. You’ll see a sign for a restroom across a small bridge, but it’s actually a ways past the bridge, in the camping area.